Staying true to its reputation for being at the forefront of food trends, Fine Food Australia’s 2015 line-up will showcase industry leaders, trends, game changing new products, and facilitate interactive sessions – cementing its position as the must attend event for anyone in the food industry. Returning to Sydney, this year’s event will see a real focus on practical, take-away advice for all sectors of the industry, much of it direct from industry experts and figureheads. With a commitment to providing practical advice, education sessions and industry speakers will be addressing key trends and changes facing the industry such as our ageing population, food safety and labeling, the free-from boom, the edible insects movement, and the confusion surrounding the booming certified organic market. All sessions are geared around what these and other emerging trends mean for consumers and the industries catering to them. In a year of firsts for Fine Food, the Royal Agricultural Society of NSW (RAS) has partnered with the show to bring the winners of the Sydney Royal Award to the event who will share the secrets of how they won this prestigious award – a must see but limited capacity event. In another first for Fine Food, Bulla has partnered with the event as Platinum Sponsor, marking the first time in the show’s history that such a major collaboration will take place – the pinnacle of which is the Bulla Pastry Stage featuring the renowned Kirsten Tibballs. This stage will showcase everything bakeries and businesses need to know about new techniques and baking sweet treats, as well as delicious delights that customers can’t refuse! In addition to looking at the serious side of the food service industry, Fine Food also knows that it’s an industry full of fun, and the competitions and demonstrations around the event will give visitors a taste of just that. From the first ever Fonterra Foodservice Battle of the Pacific to the much loved Great Aussie Pie Comp and the hotly contested Australian National Team Selection at the Culinary Challenge – if it’s heat you want, hang around the various the competition kitchens on the show floor! The Nestlé Golden Chef’s Hat Award, Australia’s longest running culinary competition for young chefs, has also announced that the 2015 National Final will be held at this year’s Fine Food Australia. 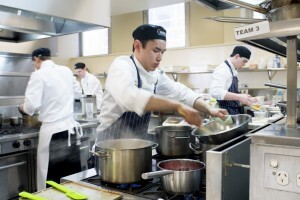 Held over two days, the National Final will see finalist teams cook-off live in purpose built kitchens. This year has set a new benchmark for the Nestlé Golden Chef’s Hat Award in terms of participants in the program, with the highest number of registrations ever received, so the competition – and the fun – will be fierce! Fine Food Australia is the country’s largest and most comprehensive food and hospitality event, showcasing everything from specialty and bulk foods, beverages, cooking and hospitality equipment and machinery, to bakery products, coffee and emerging food trends. The event offers one on one sessions with industry leaders, educational classes, demonstrations, and competitions, as well as the opportunity to build relationships, drive business, and be inspired about the industry. With the recent implementation of greater tax breaks for small businesses, this year’s Fine Food show is also a great opportunity for businesses to take advantage of the show specials, and for visitors to find new products and equipment to improve their businesses. Seasonal packaging: worthwhile or costly waste of time?